Chicago’s Catherine Edelman Gallery is renown for photographic exhibitions, and they have expanded via their new Edelman Projects Presents , as a way to showcase work that is outside the photographic medium. 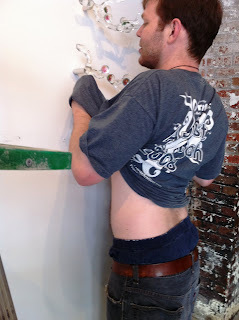 Tim Tate, along with painter Fred Stonehouse are the featured artists in the current two-man exhibition. Tim’s work on exhibit is his 21st Century Sideshow. 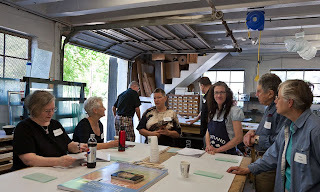 Want a quick trip to Chicago to see the show – well, click on the link below, and Tim Tate will take you through the exhibition! 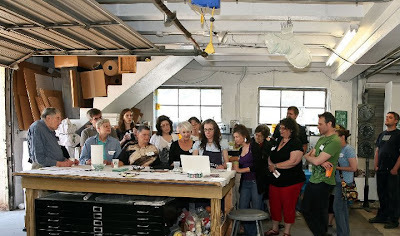 Artist Talk with Tim Tate (2011) from Catherine Edelman Gallery on Vimeo. 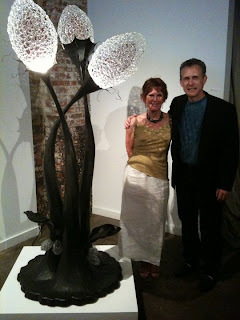 The show is open at Catherine Edelman Gallery through July 9, 2011. 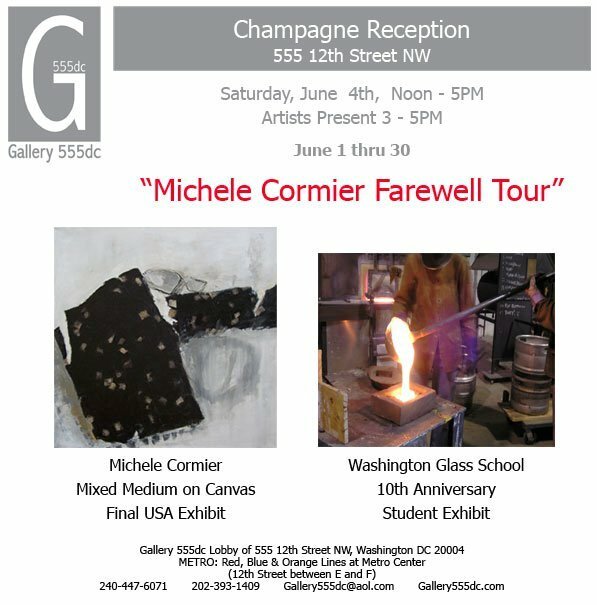 > Jodi Walsh – owner of DC’s Gallery 555dc, visited the Washington Glass School to jury works by students for a new glass sculpture show that opens this Saturday, June 4, 2011. The judging took place over the Memorial Day weekend. 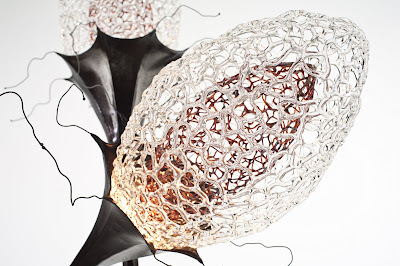 Erin Antognoli’s glass and steel sculpture is reviewed. All manner of glass sculpture are discussed by the jury. Patrick Truby’s cast glass and forged steel work in the foreground. 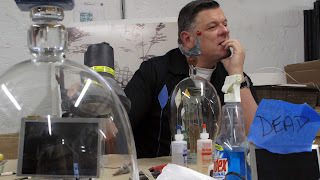 Director Erwin Timmers points out some of the finer details. Congratulations to all the artists selected for the show – it should be a great event! Washington Glass School artists in the exhibit include: Patrick Truby, Graham Fox, Nancy Donnelly, Robert Kincheloe, Teddie Hathaway, Brenda Dean and Erin Antognoli. Exhibition Dates: June 1 – June 30, 2011. 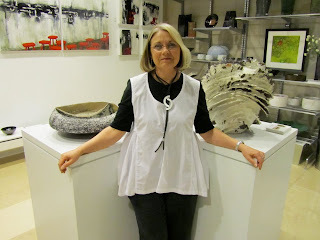 The gallery will also feature paintings by Michele Cormier. 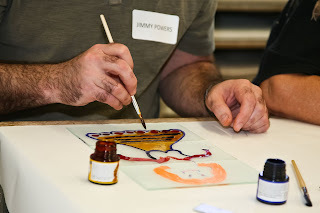 Superstar stained glass artist extraordinaire – Judith Schaechter – wrote about this very subject as a paper she presented at the last Glass Arts Society conference – titled “Beauty & the Beef” . 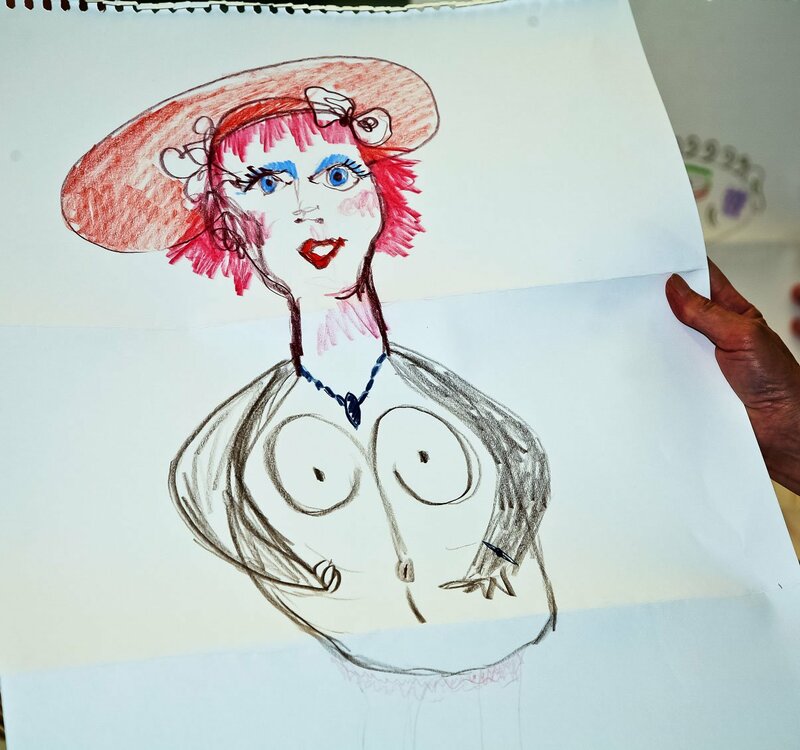 “why did beauty go out of style in the art world? Judith recently taught a creativity workshop at the Washington Glass School. Click here to jump to her full blog posting. 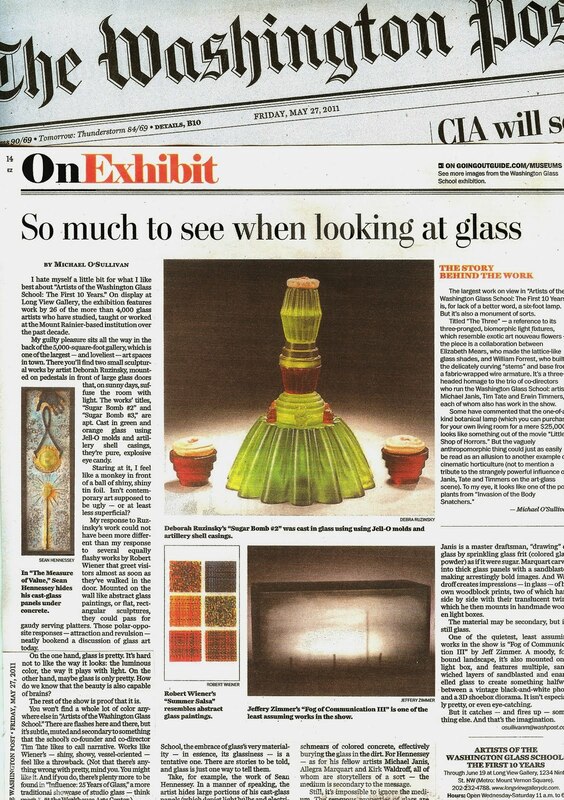 The recent Washington Post article about the 10 Year Anniversary Washington Glass School exhibition at Long View Gallery brings up notions of beauty – where critic Michael O’Sullivan questions if contemporary art must be ugly – if only to be less superficial – had me looking into what defines beautiful – or at least the “culturally conditioned concept of beauty”. Philosophy professor Denis Dutton (and the editor of Arts & Letters Daily) suggests that humans are hard-wired to seek beauty. In this TED talk on the notion of beauty, Prof Dutton collaborates with animator Andrew Park to illustrate his theory on beauty — that art, music and other beautiful things, far from being simply “in the eye of the beholder,” are a core part of human nature with deep evolutionary origins. Robert Pirsig delved into similar concepts in his 1974 book Zen & the Art of Motorcycle Maintenance . But certainly there’s more to it these days than just appreciation of well made things. Or understanding of value connectedness or whatever it was that Pirsig described. More so than ever these days, higher value is placed upon appreciation of things that make the patron/viewer feel special, smart, successful. Its the reason we like challenging & complicated works of art, with symbolism, context and references that invite us to figure them out. (Challenging, but not too challenging that we can’t figure it out.) Its valued more when there is a bit of work or effort invested. 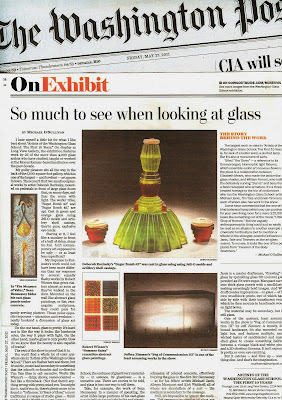 Washington Post asks "Is Glass Only Pretty?" The Washington Post newspaper arts critic Michael O’Sullivan has a lengthy review of the Long View Gallery 10th Anniversary exhibition : Artists of the Washington Glass School – The First 10 Years. Michael finds artworks that move him and question if contemporary art must be ugly – if only to be less superficial. 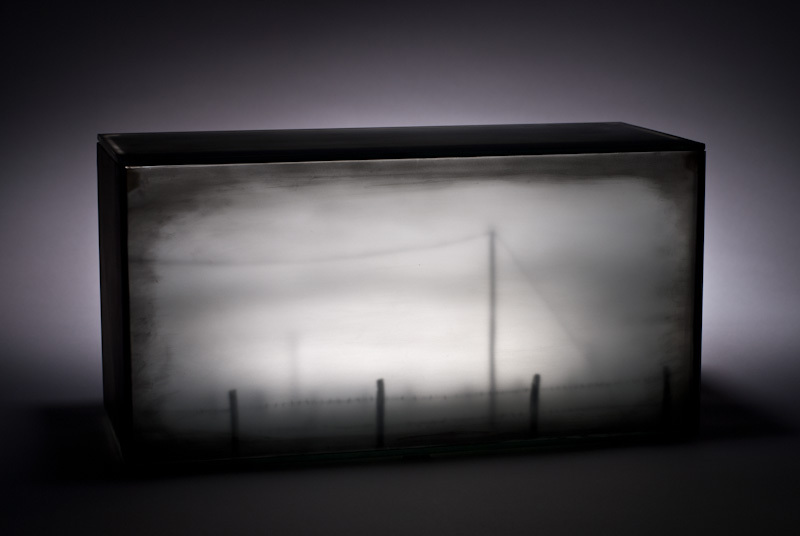 “One of the quietest, least assuming works in the show is “Fog of Communication III” by Jeff Zimmer. 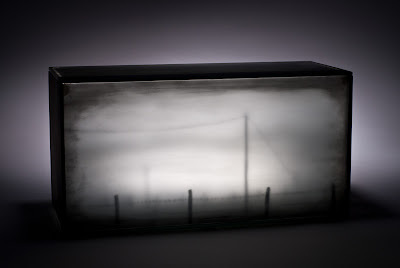 A moody, fog-bound landscape, it’s also mounted on a light box, and features multiple, sandwiched layers of sandblasted and enamelled glass to create something halfway between a vintage black-and-white photo and a 3D shoebox diorama. It isn’t especially pretty, or even eye-catching. Click HERE to jump to the full Washington Post article. 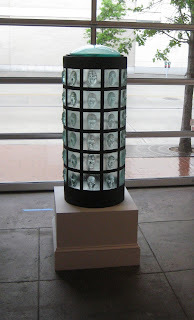 The Washington Post also goes into the background story of one of the largest works in the show – “The Three” by Elizabeth Ryland Mears and William “Tex” Forrest. 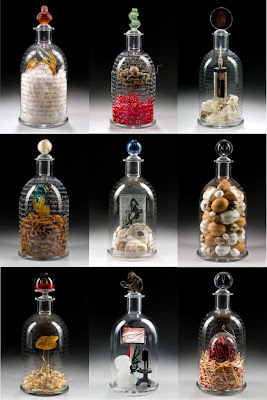 Jennifer Lindstrom What is Home? Click HERE to jump to the Washington Post’s photo gallery of some of the works in the show. 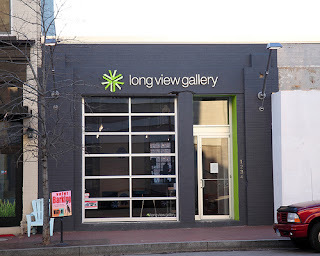 The WGS 10th anniversary show at Long View Gallery will be on exhibit until June 19, 2011. Featured artists include: Tim Tate, Michael Janis, Erwin Timmers, Elizabeth Mears, Syl Mathis, Lea Topping, Robert Kincheloe, Alison Sigethy, Dave D’Orio, Anne Plant, Jeffery Zimmer, Teddie Hathaway, Jackie Greeves, Kirk Waldroff, Debra Ruzinsky, Tex Forrest, Diane Cabe, Robert Wiener, Nancy Donnelly, Sean Hennessey, Cheryl Derricotte, Jennifer Lindstrom, Michael Mangiafico, Allegra Marquart and m.l.duffy. There is an artist talk on Sunday, June 05, from 3-4 pm. There is a 10 Year Anniversary celebration that will be held at the Long View Gallery, Sunday, June 19, from 2-5 pm. 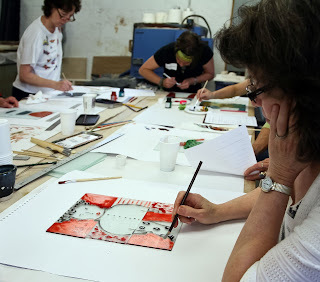 Judith workshop was geared towards getting the participants to expand their creative practice, and had some fun creative exercises for everyone. 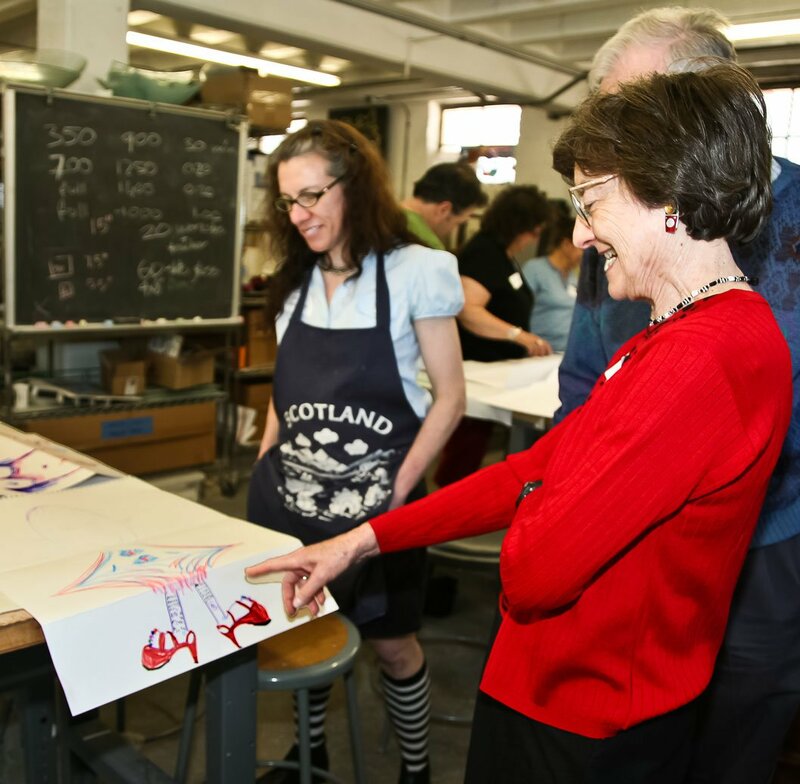 Judith has plans for the unsuspecting class. 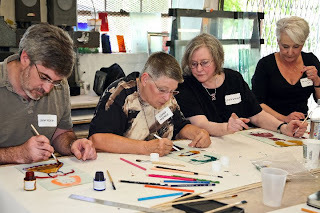 L-R Jimmy Powers, Clemmer Montague, Sherry Selevan, Diane Cooper Cabe begin unleashing their creative wills. Judith shares her thoughts with Elmerina and Paul Parkman. Soon creativity is flying around the school – unstoppable. Ideas for artwork, fashion, events – everything at once. The innermost thoughts of the participants are explored. 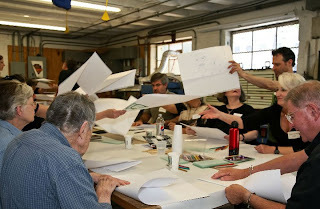 Judith indicates her approval of the designs. What one of the students was contemplating. See more of Judith Schaechter’s work in the exhibition “History in the Making: Renwick Craft Invitational 2011,” on display at the Smithsonian American Art Museum’s Renwick Gallery through July 31. The show was curated by Renwick curator Nicholas R. Bell. 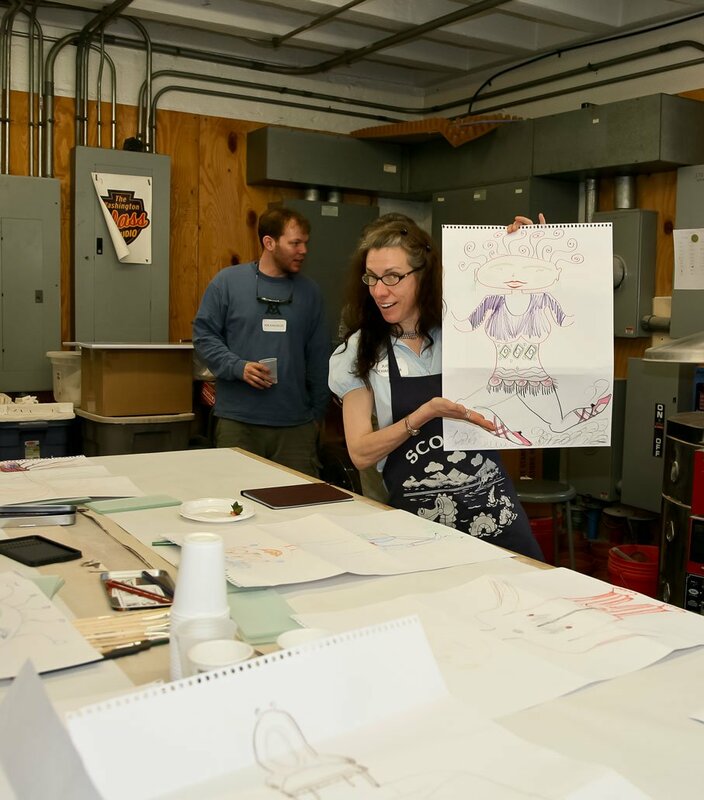 The artists were selected by Bell, Ulysses Dietz, senior curator at The Neward Museum and Andrew Wagner. The exhibition also features the work of silversmith Ubaldo Vitali, ceramic artist Cliff Lee and furnituremaker Matthias Pliessnig. The show is from June 1 – June 30, 2011. 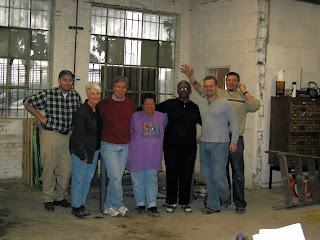 The reception is Saturday, June 4th, 2011 – noon to 5pm; Artists present 3 – 5pm. Huge turnout at the opening of WGS’ anniversary show. 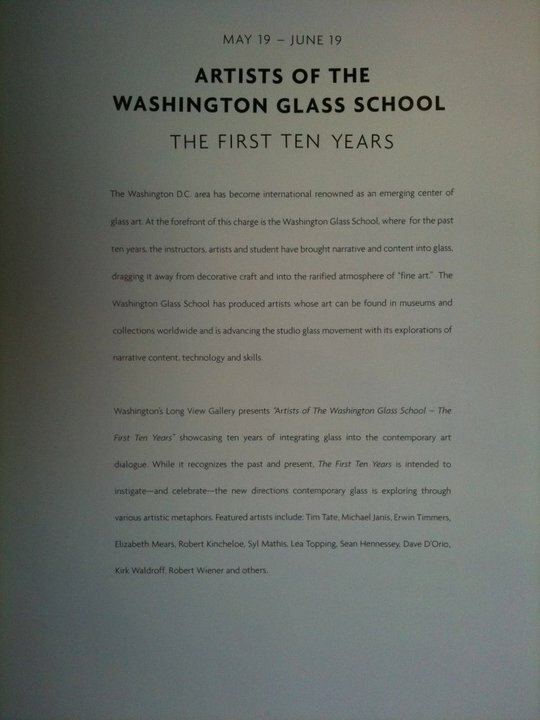 The much anticipated Washington Glass School 10th Anniversary exhibition show opened on Thursday, May 19th. 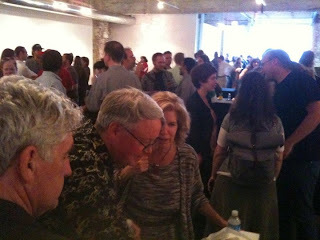 The gallery estimated that the crowd attending was over 400, and the opening event was a great success! 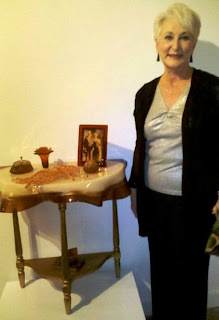 Diane Cooper Cabe next to her glass, wood, copper & mica work “La Bella Figura” - photo by Michelle Delino. 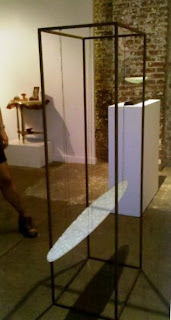 Syl Mathis’ cast glass boats - photo by Michelle Delino. 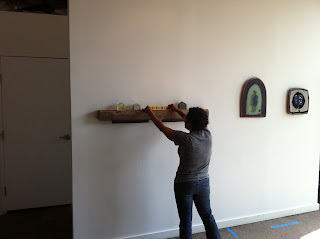 There is a closing reception scheduled for Sunday, June 19, from 2-5 pm. When Tim Tate started out as a glass artist there was almost no place locally that he could study glass sculpture. 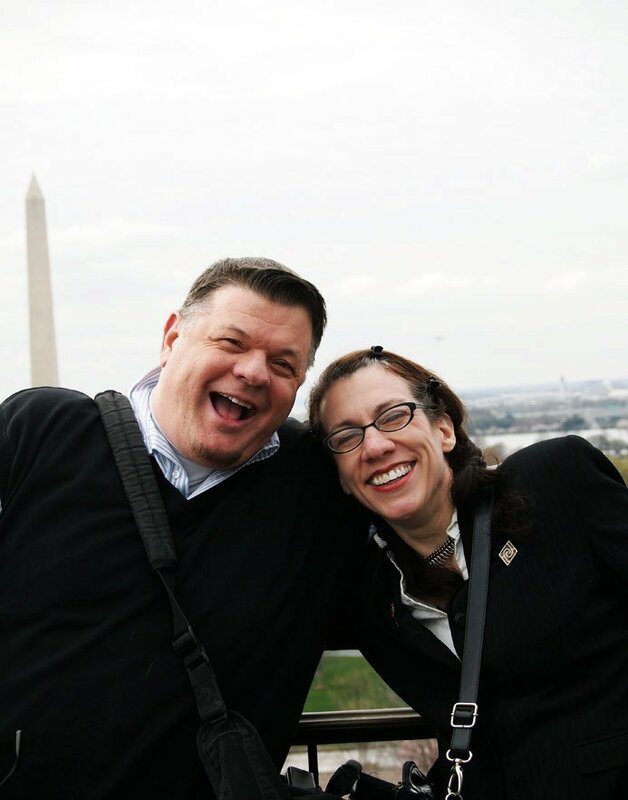 A third generation Washingtonian, Tim had to leave the region to be able to interact with the medium he fell in love with. 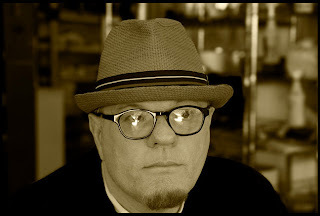 For 10 years, he spent every vacation, every free moment, at various arts facilities throughout the country learning as much as possible about every aspect of the medium. After a personal event sent him to Penland School of Craft for several months, Tim left the concept of technique driven vessels behind, and began his decade long passion for narrative, content driven sculpture. By working with content, Tim had found his voice. 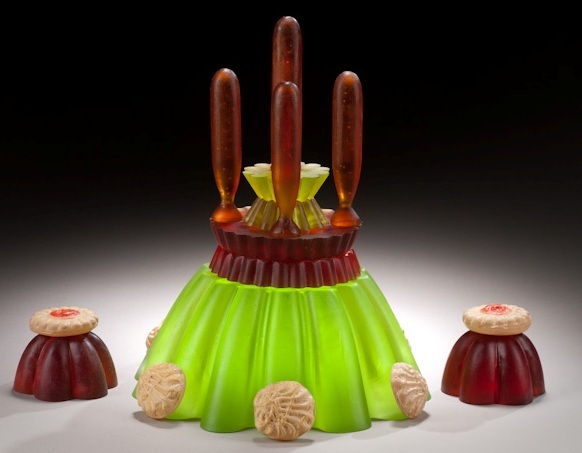 With this clarity of focus Tim sought to enhance the position of glass as a sculptural medium to the Washington, DC art scene. 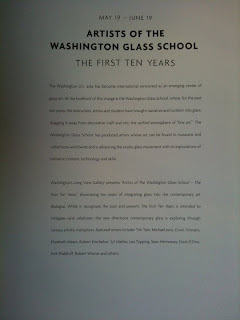 Tim’s first step: he founded the Washington Glass School. 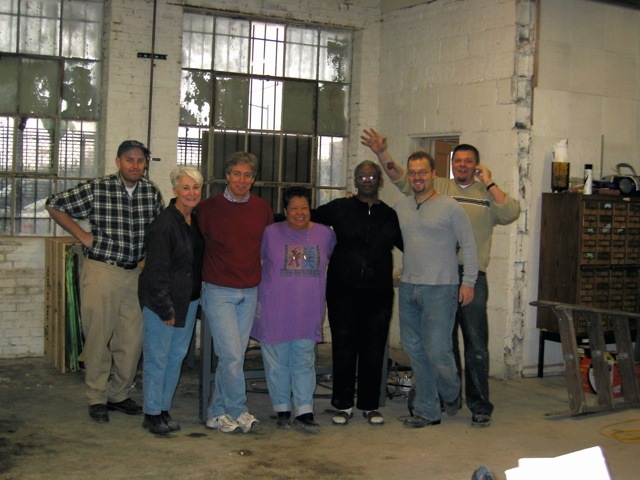 Working with Erwin Timmers and a dedicated group of volunteers, they began by clearing space out of one of DC’s abandoned school buildings that was converted to artist studios. 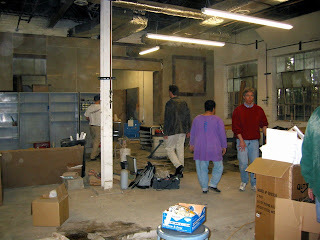 That task was a hard enough start, but after a summer of preparation of the studios, the school was challenged by situations outside if its control. The first class occurred just days after 9/11. Thinking the students would want to cancel after so disturbing an event, Tim called all the students – who unanimously asked for the class to go on. In frightening and unstable times, Tim discovered that people like to work through pressures by creating artwork. The glass school has sought to become the refuge for those seeking artwork as a way to help define and express themselves. 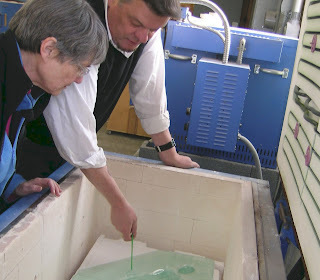 Tim advises a student about a casting technique. Over the past ten years, the school has grown greatly – crossing the threshold of 4000 students since its opening. The glass school has been host to dozens of nationally recognized instructors and students from 4 continents and many countries. Click HERE to jump to the NPR segment “Tim Tate’s Hi-Tech Art”. 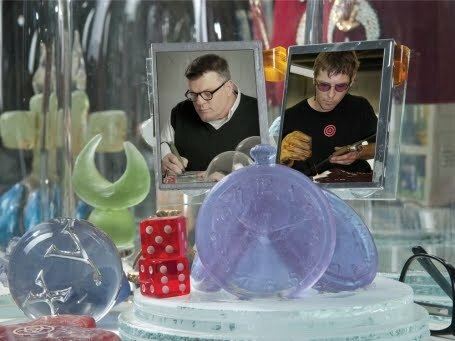 Tim has become an enthusiastic promoter of the medium, finding new ways to have artists of other media integrate glass into their works. He also works with other glass artists on collaborative works that takes both artists to new levels that they could not achieve on their own. 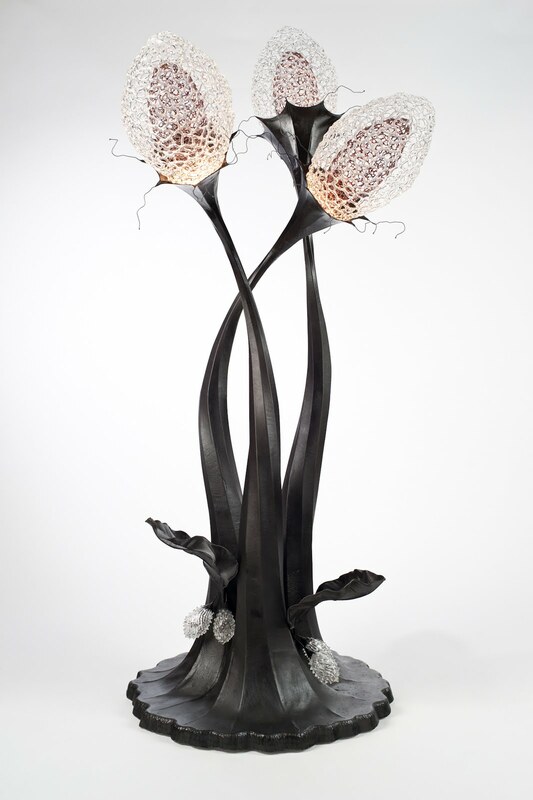 Most notable are the series that Marc Petrovic and Tim Tate worked on together – the Apothecarium Moderne and the Seven Deadly Sins – which was recently featured in American Craft Magazine. 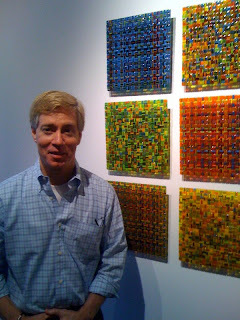 Tim has shown nationally and beyond, including exhibitions in the Museum of Arts and Design in New York; SOFA New York and Chicago; Art Basel Scope in Switzerland; Red Dot at Art Basel-Miami; the Luce Foundation Center for American Art at the Smithsonian; the Renwick Gallery and commercial galleries from Washington, DC to London and Berlin. His awards include “Rising Star ” from the American, the Virginia Groot Foundation Award for Sculpture, three Artists Fellowship awards from the DC Commission on the Arts and Humanities and the Mayor’s Art Award. 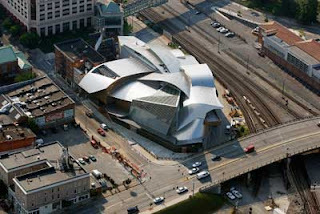 His work is in the permanent collections of the Smithsonian American Art Museum, Renwick Gallery, the Mint Museum, the Fuller Museum, the Katzen Art Center of American University, the Milwaukee Art Museum and Vanderbilt University. Tim Tate was just awarded a Fulbright, and in 2012, he will be at the UK’s University of Sunderland and the National Glass Centre. 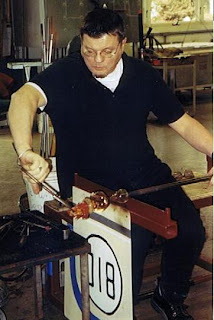 He has an upcoming solo show at the Taubman Museum in Roanoke, Va.
>The installation of the Washington Glass School retrospective at Long View Gallery’s incredible space has begun. L-R Robert Wiener & Sean Hennessey‘s works installed and looking good. 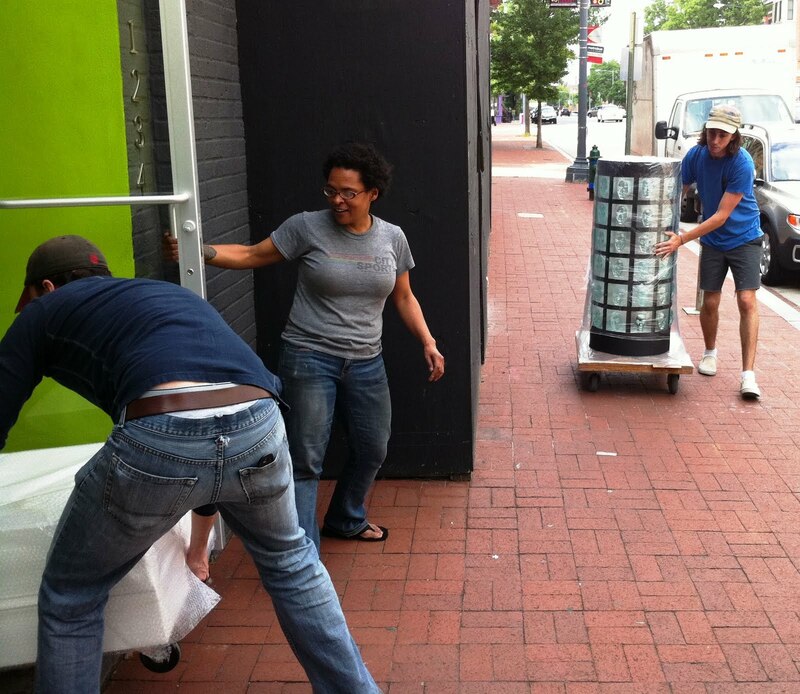 m. l. duffy’s glass & steel sculpture comes rolling up 9th. 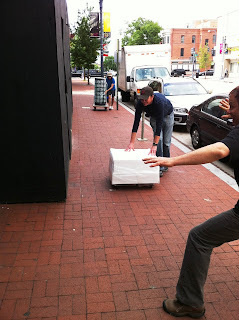 Erwin Timmers directs the sidewalk traffic to make delivery… easier. Jennie Lindstrom helps out the crew. 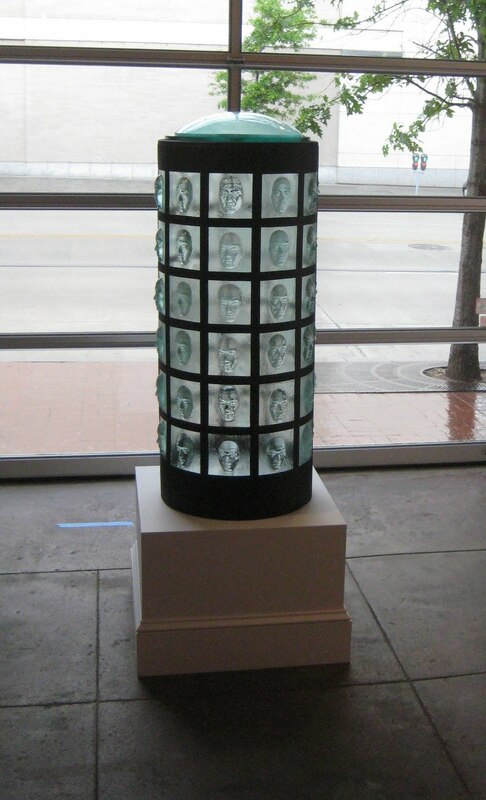 m. l. duffy’s cast glass and steel piece located at the front of the gallery. Jennie then gets working on her artwork installation – next to glass artwork by Jackie Greeves. The installed works look amazing. This show (10 years in the making) shows a cross section of artists who are working outside the traditional notions of glass art and that look to the future of the medium.